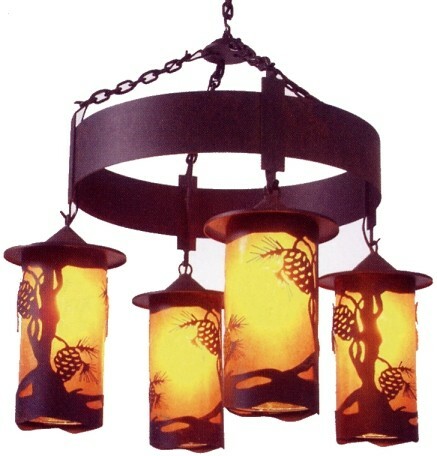 Four pinecone lanterns are suspended from a round band to create this unique rustic chandelier. Made in the USA. 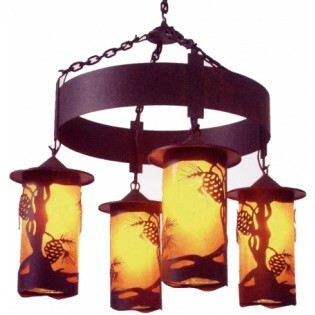 Four pinecone lanterns are suspended from a round band to create this unique rustic chandelier. This Pasedena Pine Cone Chandelier measures 34"H x 30"W and uses four 150 watt regular base light bulbs. Ships directly from the manufacturer, please allow approx. 3 weeks for delivery. Made in the USA.